Too French? Nike Rolls Out U.S. World Cup Soccer Uniforms : The Two-Way The new jerseys feature a familiar U.S. badge on the chest. But they depart from the previous uniforms by using thick bands of the national flag's three colors. 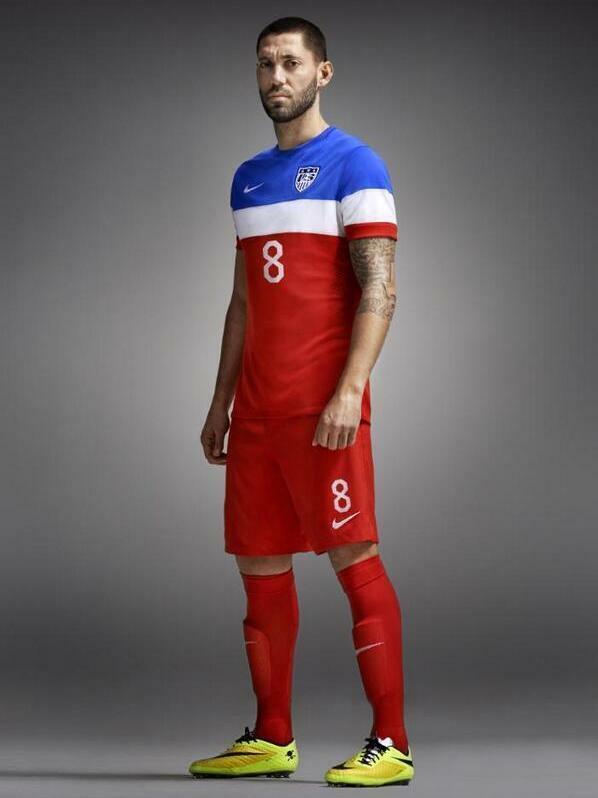 U.S. men's national team captain models the new World Cup uniform. The kit, unveiled by Nike Tuesday, uses wide bands of color instead of stars or stripes. French cyclist Thomas Boudat celebrates his win at the track world championships last month. Critics of the new U.S. soccer uniform say it too closely resembles the French flag. U.S. forward Sydney Leroux wears the new national team uniform, in a photo released by Nike Tuesday. The jerseys America's soccer players will wear at this summer's World Cup are out – and they're attracting attention with their striking departure from previous designs. The uniforms use large swaths of red, white, and blue, in a combination some are comparing to the French national flag. Others say it looks like the Russian flag. The new jerseys feature a familiar U.S. badge on the chest. But the "away" version, which by tradition has the boldest colors, departs from previous designs by using thick horizontal bands of the national flag's three colors rather than evoking its stars and stripes or using one primary color. The U.S. national team's 2010 World Cup away jerseys were mainly blue, with a diagonal white stripe. Nike unveiled the new look Tuesday morning, announcing it on Twitter along with the tagline, "Fear no moment." A release on Nike's website says the new uniform includes several technical features, such as "laser-cut perforations for ventilation" and Dri-FIT polyester, which the company says is created from recycled materials. Nike says the uniform will help U.S. players cope with what are expected to be warm and humid conditions in Brazil when World Cup play begins in June. But it's the colors that command the most attention, with blue and white bands across the athletes' shoulders and chest and what Nike calls "a prominent red" making up the jersey's bottom half. The official uniform will also include red shorts and red socks. "I like the patriotic design and color scheme and I think it will look great on the pitch," men's national team captain Clint Dempsey said in the Nike release. "Hopefully they will serve us well as we head into a competitive group." So far, the public's response has been mixed. With the reminder that the Internet can sometimes magnify negative reactions, we'll quote Twitter user Alex Kowalsky, who responded to Nike and U.S. Soccer, "this is surely either an April fools joke or a poor ploy to confuse our group of death." And John Robinson said, "nothing strikes fear into Portugal like Clint Dempsey the Domino's pizza delivery guy." One comment reacting to the U.S. Soccer announcement read, "Yugoslavia is back!" Another simply asked, "How did you not just go full 'Captain America' with this?" The new uniform has its fans, with some people taking to Twitter to say they can't wait to buy the new jersey. "The #USMNT away kit looks pretty dope," wrote a user named Manny Gomez. Another fan said the uniform is "absolutely terrible... but you know what makes a good kit is a kit you win in." "The negative social media chatter focused on its simplicity, which some compared to a firecracker ice pop. Others said the even strips of red, white and blue made it look too close to the jerseys worn by France despite these being a lighter shade of blue. 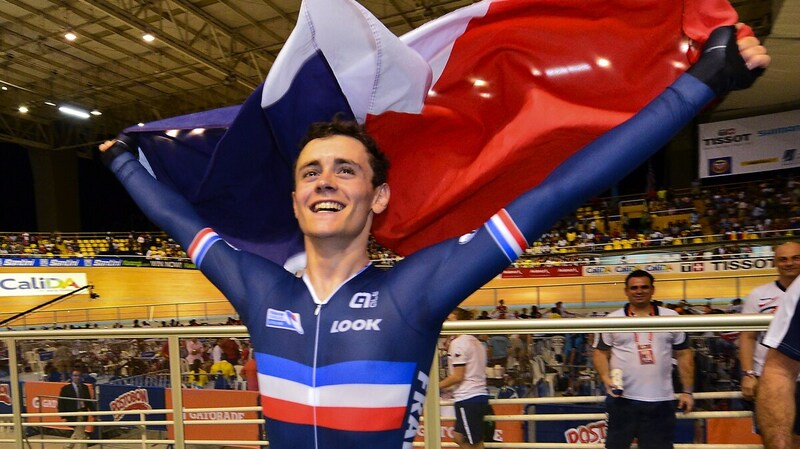 France's jerseys, also made by Nike, don't feature the country's flag this year." The new uniform also includes a women's version, with U.S. player Sydney Leroux sporting the jersey in photos released by Nike. The women's World Cup will be held in Canada next year. If you're a fan of the new uniforms, you can pick up a match version of the men's jersey at the Nike site for $150.